The following excerpts are taken from NEX. The visit by the Korean Actress and ambassador to Singapore on 17 August 2006 was a remarkable event. 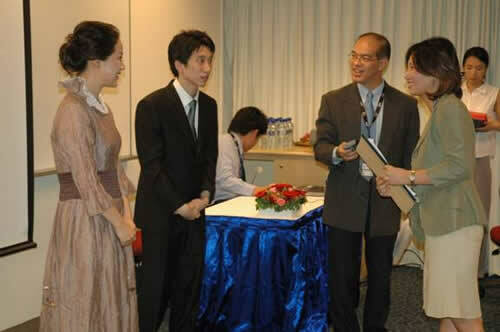 Ms. Yang Mi Kyung, the supporting actress for the drama serial - Da Chang Jin (大长今), The Jewel in the Palace, graced upon the National University of Singapore Extension's (NEX) and interacted with the students and teachers in the Korean Learning Programme (KLP) class. "